15cm sIG33/2 (sf) auf GW 38(t) "Grille"
This volume from Nuts & Bolts on the 15cm sIG33/2 “Grille” Ausf.M is part 1 with the second volume to focus on the other versions and is very timely with the recent release of the DML kits of the Munitionswagen 38 M für s.I.G.33/2 (kit #6471) and the Geschützwagen 38 M für s.I.G.33/2 (kit #6429). The book is in the usual Nuts & Bolts soft cover A4 format with 120 pages that include both English and German text and includes many B&W wartime photos and colour walk around shots of preserved museum vehicles as well as numerous 1:35 plans and colour profile drawings of different “grille” versions. 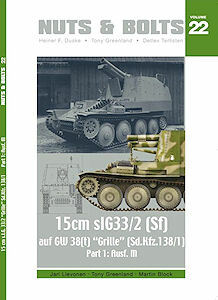 The book covers both the 15cm sIG33/2 armed and the unarmed Munitionswagen version with photos, plans and colour plates for both types adding to its value as a reference for the above kits. The first 27 pages are mostly text with a few photos and cover the development history and technical description along with production data including charts showing the production numbers of both types from 1943 to 1945. 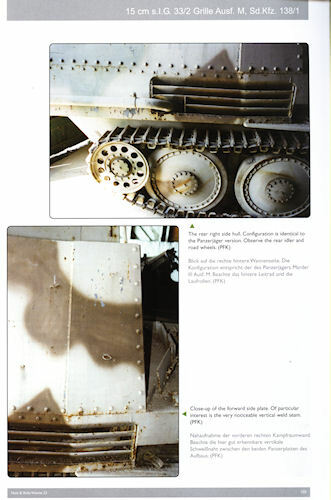 There is also detailed charts and text on the organization and delivery to units equipped with the “Grille” as well as sections on the tactical use and camouflage and markings and a section listing the available kits and accessories for the “Grille” with the DML Munitionswagen just making it into the book. These notes give a fairly comprehensive coverage of the “Grille M” that should provide enough background information for the average modeller as well as those wanting to delve a little deeper. 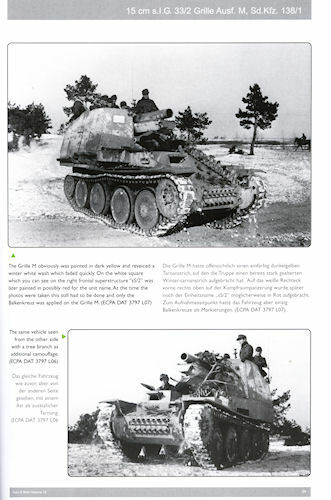 The next 21 pages include many wartime B&W photos (mostly two per page) with the captions in English and German describing the vehicle shown to give a good overall coverage of the types with the photos including both clean factory shots to action shots that give good coverage of the markings and storage as well as some of the vehicle details. As mentioned both the Gun and Munitions vehicles are shown in the photos. 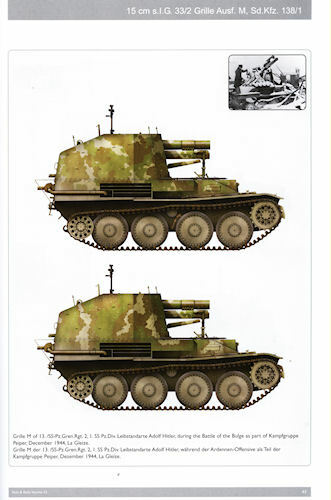 Following this are 10 pages with sets of 5 view 1:35 plans for the 15cm sIG33/2 “Grille” Ausf.M and Munitionswagen 38 M für as well as sectional plan views showing the interior gun mounting and ammo storage for the “Grille” Ausf.M plus overall view drawings to supplement the plans and give perspective to the details which will come in handy when building the models. This is followed by 11 pages with colour profile drawings of various vehicles to give good examples of the many camoflague schemes carried on the “Grille”. Most also have a small B&W photo of the actual vehicle but these are very small and don’t offer much in the way of extra info but show at least that the illustration is of a real vehicle and not just made up. 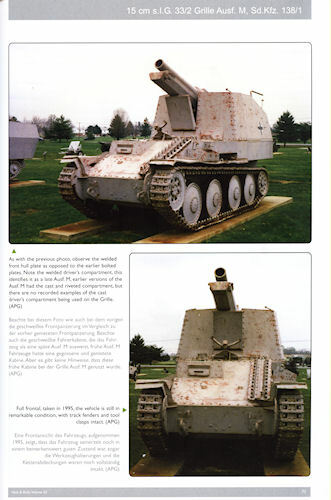 The next 44 pages are all in colour with overall photos and descriptions of museum vehicles from Aberdeen Proving Ground and Patton Museum Fort Knox with captions giving a brief description as well as numerous detailed close up walk-around shots of the hull exterior covering virtually every detail such as the road wheels, drive sprockets and idlers as well as the tracks, the front plate and glacis, driver’s hood, visors, fenders and equipment brackets, the barrel travel lock and engine deck and the rear mounted exhaust pipe. 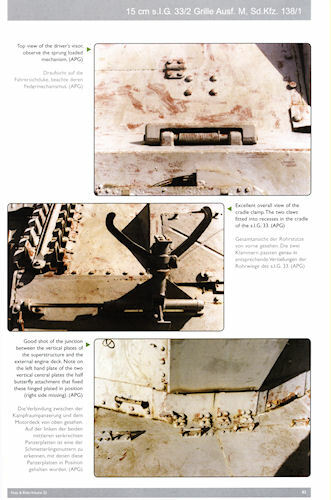 The upper superstructure and gun barrel/cradle are also shown in close-up before the photos move to the inside of the fighting compartment with equally good close up shots of the gun breech, gun controls and gun mounting as well as the ammo storage racks, radio racks (the radios are missing unfortunately) with many of the details such as the gun and ammo racks shown from various angles to give a very good overall coverage of the details. Some of the interior parts are not in pristine condition but overall most of the features still remain to show plenty of detail for building the models. The final 6 pages have models built by Tony Greenland and details the construction of a “Grille” M using bits from Tamiya Marder IIIM the Alan Grille kit as well as parts from ABER and a lot of scratch building to produce the final model of the “Grille” M. Of course all this is academic now that DML have released their kit of the “Grille” M but the photos still can be used as a good guide to detailing up DML kit in any case. There are also a few shots of the DML Munitionswagen 38 M für built straight from the box to show the end result. 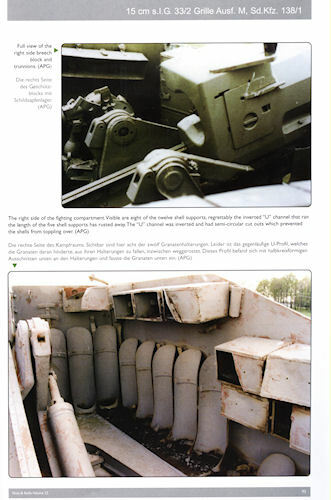 This is another excellent volume in the Nuts & Bolts series covering this time the Geschützwagen 38 M für s.I.G.33/2 and Munitionswagen 38 M für s.I.G.33/2 with extensive detailed close-up photos of both the exterior and interiors of the vehicles. The book has a good mix of technical and development info as well as wartime photos, museum walk-around photos and extensive 1:35 plan coverage and is just the reference for those building either of the DML kits or still struggling with the older Alan kit.